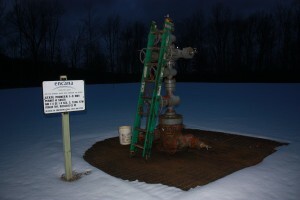 Encana's State Pioneer 1-3 deep frack well in Michigan's Pere Marquette State Forest, Missaukee County. Photo by LuAnne Kozma. January 2012. Jessica Ernst, a scientist from Alberta, Canada, shared this comment letter with New York’s Department of Environmental Conservation and with Ban Michigan Fracking, to warn of the dangers of gas drilling. We need more truth-tellers like Ernst. EnCana is the same company that is fracking in Michigan. If you are a lease holder, or thinking of signing away your mineral rights, please read Ernst’s letter (below). Don’t sign a lease. And contact us and join the fight to ban fracking in Michigan. Read Ernst’s entire public comment letter and report here: 2012 01 12 updated gas migration paper & Ernst to NYDEC. This injection well, Weber 4-8, in Mayfield Township, Grand Traverse County (Michigan) is the disposal site for the waste from several of Encana's deep shale frack wells in Kalkaska and Cheboygan counties. Photo by Ellis Boal. January 2012. I hiked in New York State most weekends in the fall as I was growing up in Quebec. I love New York. You have much to protect from the new brute force highly risky and toxic hydraulic fracturing. Please stop believing industry’s lies, promises and assurances. Please stand up to the corruption seething around the world, especially in our politicians and captured energy regulators and do the right thing – say no. I am a scientist with 30 years experience working in Western Canada in the oil and gas industry. I am suing EnCana, the Alberta Government and energy regulator for unlawful activities (www.ernstversusencana.ca). Albertans are told we have the best in the world regulations and regulators. My statement of claim tells a compelling tale of drinking water contamination cover-up and how even the best regulations and laws do not protect families, communities, water, lands and homes from hydraulic fracturing. I consider it part of this submission; it is available to the public on the case website at the above link. I had an incredible supply of fabulous water. I miss it everyday. The new frac’ing is a global issue, a scary Hellish one. I live it; I’ve been a frac guinea pig for a decade. The historic record (1986, attached after my submission) on my water well in a regulator commissioned report states: Gas Present: No. Prior to the arrival of experimental, brute force hydraulic fracturing (2001) in my community, only 4 of 2,300 historic water well records noted the presence of a gas that could be methane within about 50 square kilometers around my water well. After EnCana fractured my community’s fresh water aquifers, there was so much gas coming out of my well, it was forcing water taps open making them whistle like a train. Bathing caused incredibly painful caustic burns to my skin. As water wells went bad community wide, we got the same promises fractured communities get everywhere. For example: “We only fracture deep below your drinking water supply, deep below the impermeable layer to prevent gas from migrating into your water.” They reminded us that Albertans are blessed with “World Class, Best in the World” regulators and regulations, while quietly deregulating and taking our rights away to accommodate the inevitable frac impacts. My water is too dangerous to be connected to my home; the isotopic signature of the ethane in my water indicates the contamination comes from EnCana’s gas wells. In 2006 in the Legislature, the Alberta government promised affected families a bandage – safe alternate water “now and into the future.” They broke that promise and ripped the water away. I drive more than an hour to haul safe water for myself. I learned that when you’re frac’d, there’s no after care. What happened in my community is reportedly happening everywhere they frac, regardless of company or country. Americans are fortunate to have the Environmental Protection Agency (EPA) and federal health officials (Agency for Toxic Substances and Disease Registry) that warned Pavillion citizens to stop drinking the water. EnCana frac’d hundreds of metres more shallow around my community than the EPA reports the company did at Pavillion. EnCana was also stingy here with surface casing. Alberta’s regulator found much more methane in my water than the EPA found at Pavillion, and some of the same man-made toxics. Is that a frac coincidence? And like at Pavillion, and in so many contaminated communities in the USA, the company still has not disclosed all the chemicals they injected, and our regulators and governments refuse to make them. Hexavalent chromium was found in a regulator monitoring water well; the regulator didn’t share this with my community, it was gleaned it through my Freedom of Information request. In another regulator monitoring water well, they found no water, only methane and ethane – so much so that the gas was forcing the lid open – like the gas did to my water taps. Did they warn anyone? No. 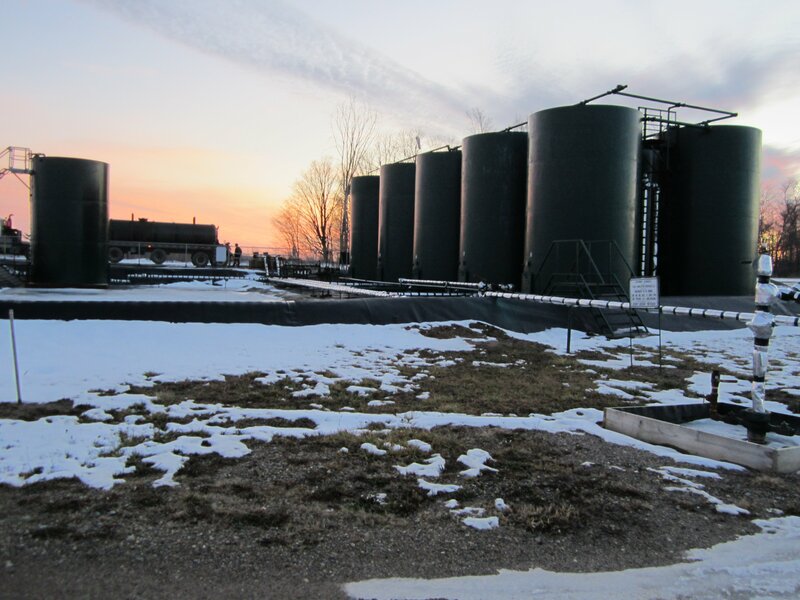 They commissioned reports that ignored all the damning data and the historic records, and used unsubstantiated claims of gas in other water wells to blame nature. I see no help from the Canadian Association of Petroleum Producers, American Petroleum Institute, Groundwater Protection Council or FracFocus and its newly released Canadian cousin. I do not believe that multinationals keep chemical secret for proprietary reasons. I believe they keep them secret because companies know their drilling and frac’ing – waterless or not – is irreversibly contaminating groundwater, and they do not want anyone to be able to prove it. Recently, EnCana drilled more gas wells around my home and under my land. I thought of farmers around the world as I watched EnCana dump their toxic waste on my neighbor’s agricultural land and pump undisclosed chemicals labeled flammable down their gas well to be fractured above the Base of Groundwater Protection near my home. Even the best laws and regulations will not protect New York’s water and people from this arrogant, bullying, deceptive, uncooperative, “bad neighbour” industry. Shamefully, the revised draft Supplemental Generic Environmental Impact Statement (dSGEIS) on highvolume horizontal drilling and hydraulic fracturing is nowhere near O.K., never mind the best. I get “Best in the World.” Look at what Poland gets. What does New York get? Who will de-flame and purify your water, and detain your corrupt state and corporate officials? I’ve learned that frac’ing is hideous, but what follows reveals true inhumanity and greed. Please find my comments with supporting documents attached. Thank you.